Introductory offer: two for the price of one, additional 10% off when signing up by April 15! 4. Estimating Bids for Greater Profit. Seats are going fast, grab yours today! Are you thinking about bidding on public construction jobs? California has 100 billion dollars of approved public works project that require Disadvantage and Small Business Enterprise participation goals. What does that mean to you? It means money and growth for your construction business. Before you can take advantage you must learn the rules. This certificate series is design to be your blue print to succeed in public work construction. It covers how to structure your business for the proper record keeping, explain the language of public works, prevailing wage, and the laws that govern public works. It will cover the difference between bidding private vs. public jobs. You will also be connected to Santa Monica SBDC for 1-on-1 assistance to put what you learn into your business. The most important element of building a great house or building is a solid foundation. This class is the foundation of your business. 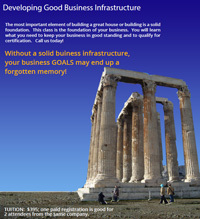 You will learn what you need to keep your business in good standing and to qualify for certification. What you learn will help you through certification and finance applications. Safety is emphasized in Public Construction. Hazard Communication Plan, Illness and Injury Prevention (IIP), Respirator, Quality Control and Site Specific Safety plan are policies you need to have in place. 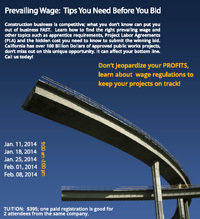 Have you seen bids with the term “this is a prevailing wage project”? Did you receive a fine from the Department of Industrial Relations (DIR) on a prevailing wage project? The DIR reported record fines against contractors for non payment of prevailing wage. Prevailing wage is a predetermined wage rate that you must pay your employees. Sounds simple enough however there are many different prevailing wages. Estimating for a private job and a public prevailing wage job are two very different processes. Learn what the differences are? Learn the difference in labor cost. Learn the questions you need to ask to make sure your bid is complete but profitable. You just won a public work contract, now what? Know what to expect before you win your first government contract? 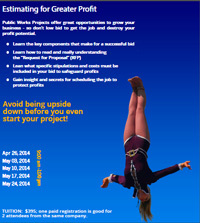 Learn what to expect once you have won a public work contract. The required documentation can be overwhelming.